In Turkish cuisine, there are groups of dishes where a particular type of sauce or pastry might be used as the base, but then the fillings can vary. Olive oil dishes are an example of this – on the blog, we’ve got a recipe for okra in olive oil, or you can make green beans in olive oil and barbunya pilaki (borlotti beans in olive oil). Perhaps the most common dish in this range is ekşili köfte and we love to order this when we eat at Yeşil Asma Yaprağı in Fethiye. Their ekşi sauce is a thinner version of the one we’re going to be using in this recipe – it just depends which type of texture you want and how comforting you want your dish to be. This ekşili tavuk çorbası recipe is perfect for when you’re feeling a bit under the weather. What better comfort food than a bowl of hot soup and, as anyone in Turkey will tell you, chicken soup is just about the best for combating any feverish aches and pains and general lethargy. As we’ve been feeling a bit that way, recently, and as we’ve been playing around with sour sauce dishes, we thought we’d combine the two and rustle up this Turkish sour chicken soup recipe. In Turkish villages, it’s common to boil chicken – sometimes whole chickens – for quite some time because the village chickens can produce quite tough, chewy meat. So, for this sour chicken soup recipe, as it’s the chicken stock that’s supposed to do you the world of good, we decided to use butterflied chicken thighs, skin and bones left in place. As it’ll be simmering on the hob for around an hour or so, once the soup is ready, the chicken will fall away from the bone and the skin and you can remove them at the end of cooking. A word about “Turkish saffron” – We will be using a small pinch of this in our recipe. Real saffron is made from crocus stamens, and, when you see “Turkish saffron” on the markets, you will be amazed at how cheap it is. This is because it is a plant that resembles saffron but it is actually safflower. Safflower is still good for cooking with in its own right, creating oils and adding extra flavour and the slightly orange colouring to your soup. 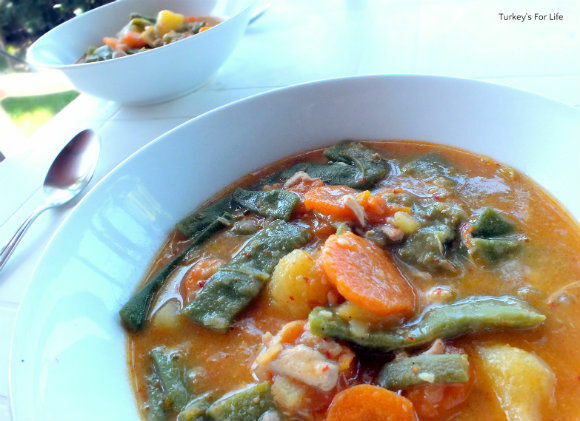 Remember, we want our Turkish sour chicken soup to be comforting – our bodies are starting to feel a bit autumnal now – so a quick exploration of the fridge and cupboards lead to a find of carrots, green beans and potatoes. All of those are going into this ekşili tavuk çorbası. And where does the sour (ekşili) bit come into it? We’re going to be using lots of fresh lemon juice. Mmm, now doesn’t that just look like perfect comfort food for when the body isn’t feeling right up there at 100%? We are just in love with this sauce – thick and wholesome, yet refreshingly tangy at the same time. Place your chicken thighs into a large saucepan. Add the carrots and green beans. Pour hot water over these ingredients until your pan is around ¾ full. Bring to the boil and then simmer on a medium heat for 10 minutes. Now add your potato, salt, pepper and Turkish saffron to the pan. Stir everything together, cover and leave to simmer for around 45 minutes. In a bowl, add your egg yolks and the flower and mix together into a thick paste. Stir in the water a little at a time until the paste is smooth. Now squeeze in the lemon juice and mix. Ladle a small amount of your soup stock into the bowl and stir that in slowly. Now pour this mixture into your pan of soup a little at a time, stirring your soup as you do so. Simmer your soup for a couple of minutes and then serve. Feel free to squeeze in more lemon juice for extra tang. This Turkish sour chicken soup recipe serves 4-6 people, depending on how thick or thin you want your soup to be. This is entirely your own preference and in Turkey, you will see really thick broths a well as thin, watery soups. The chicken meat will fall away from the bone easily so you can either remove the skin and bones from your soup before serving or, as we do, leave them in the soup and remove them as you eat. And there you have it – a yummy Turkish sour chicken soup recipe that’s packed with flavour and extra vegetables. Our soup made 4 servings because, as you can see in the photos, we made our broth quite thick. You can serve your ekşili tavuk çorbası with fresh crusty bread or, if you’re like us and have packed your soup with seasonal vegetables, it will fill you up enough if you eat it as it is. Our recipe also says to add the juice of one lemon. You can do a taste test with this. Fresh Turkish lemons are often mild in flavour and we’re in love with the ‘ekşili’ flavours at the moment so we do add extra lemon juice. If you are reheating your soup the following day, because of the flour and egg yolk mix, and your chicken stock, you’ll see that your sour chicken soup has solidified. Reheat on a low heat, adding a little more water as you go along and it will soon start to resemble soup again. Soup plays a major role in Turkish cuisine and we often experiment with various Turkish soup recipes. 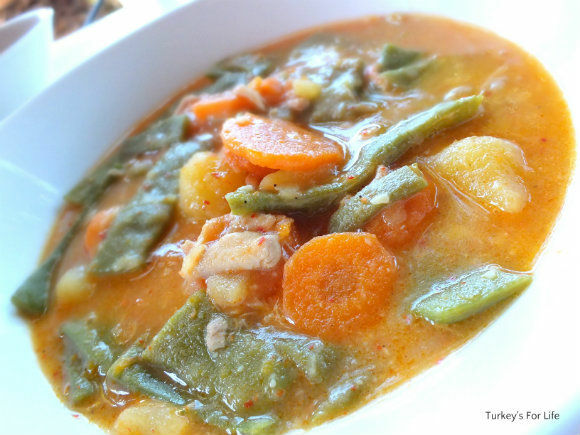 This recipe for Turkish sour chicken soup has been added to our growing collection of Turkish recipes of all varieties. Delicious; I love anything lemony this one sounds wonderful; just right for autumn and comforting, elinize saglik! We’re in love with the lemon flavours at the moment, Özlem so we’re experimenting with the ekşi dishes. Lemon and chicken go so well together in this soup. I’ve never tried an emulsion with soup, but I love the thick, velvety lemon-egg yolk with lamb, so I really have to give this chicken soup a go. I doubt I can persuade anyone to butterfly the chicken thighs, though.